So excited about this one!! Meghan Markle stepped out this morning in London to visit one of her four royal patronages, the National Theatre! As a former actress, I have a feeling this is probably one of her favorite projects to take on. 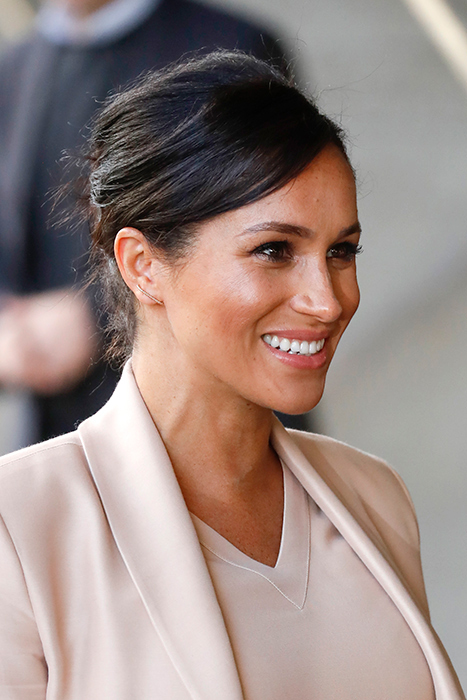 For the appearance, the Duchess of Sussex took a step away from her typical dark neutrals of navy and black for a more spring-forward hue of peach pink! The blazer and matching dress are by Brandon Maxwell, who she has worn more than once since becoming a royal. Unfortunately those two pieces are not currently available – they were open for pre-order on Moda Operandi though (with a ship date of April), so I have a feeling they’ll pop up once the pieces are ready to appear in stores in April or so! I’ll keep an eye out and let you guys know if they do! To complete this neutral look, she opted for her go-to Marilyn pumps by Aquazzura (a favorite of Meg’s), and a white + gold Carolina Herrera clutch. While her exact clutch is not available in white, you can buy it in a bunch of colors here! A great option for weddings and fancy events. I have to say, this is one of my favorite looks she’s worn since the bump has appeared! She looks extremely elegant, sophisticated and very chic. Ladylike and lovely for her first visit to this particular patronage! I adore her in color, and this peachy pink spring hue really has her glowing, don’t you think? See more photos from her visit to London’s National Theatre below and shop similar pieces to recreate her look!